First Smurf to crash the message board Hahahaha! Where is the cover image? Issue 4 of this AP already has a cover. Issue 1 & 4 at least have placeholder covers, this & issue 3 & 5 have nothing yet. What are the articles in this issue? Each of the rest of the AP has a sentence listing what articles are in them, but not this one. Also, what race/species is the lady on the cover? Tiefling? I'm very curious about her and her species, especially if she is not a tiefling. I'm guessing she's an Efreeti. A white haired one? Maybe, but she would be a first. She looks like a tiefling too, an oni blooded one. But she could indeed be an Efreeti or an Ifrit. Possibly, but Efreeti have never had designated hair colors to my knowledge. She took a Serum of Appearance Change. I'm curious if we'll be getting one of the other mainline genie-kin in the alien archive for this or one of the different flavors of ifrit from the Plane-Hopper's Handbook(Sunsoul seems particularly appropriate for the AP). That's assuming we get a new playable species at all, of course. They confirmed that we're getting all 5 of genie-kin races on one of the SF Wednesday streams, but they'll be spread throughout the AP. I really hope we get PC race stats for Salamanders, considering the lack of serpentine races so far (besides Ilthisarian). I was kind of hoping for Playable Efreeti and Azer but nope! Playable Salamanders would satisfy my planar race urge. 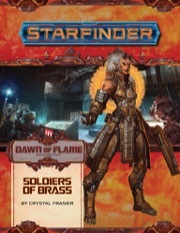 Has anyone received your subscriber PDFs yet? I am fortunate enough to have my copy! I'll do what I can to answer questions but I haven't had much more than a skim through so far. Are salamanders playable? Regardless, what geniekin (or other playable race) is in this book, if any? What's your favorite aspect of the Brass Bazaar? Salamanders aren't playable unfortunately, however we do get both Suli and Sylph instead. I haven't finished reading the Brass Bazaar section just yet, but there is an Anacite-run shop which sells robotic toys that is quite entertaining. What are the other monsters in the bestiary (name, type, subtypes, size and CR)? I got my pdf today! I always skim through the art and the articles at the back first, and I must say I'm a fan of the "Touring the Archipelago" article. It's a fun angle for examining a location. And who wouldn't like to take a tourist jaunt to the Sun? I’m so glad you enjoyed it, Elinnea! I think that’s one of the most creatively challenging thingsI’ve worked on so far! Is it just me or are the maps in the PDF, lower rez than usual? Especially the ship interior in the back of the PDF is low-rez for me. I can barely make out any details. I just wanted to personally thank Crystal Frasier for the trap in A4. Book 1 had a map of Asanatown, Book 2 sadly hasn't a map of Corona. 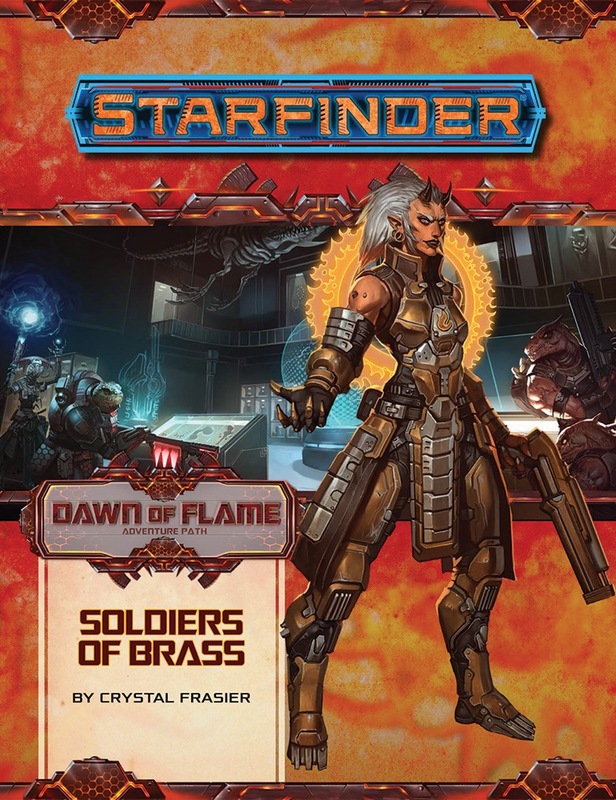 I would like a map folio for Starfinder Adventure Paths. I know "Pact Worlds" has a map, but it's not very detailed. I am seeing the same thing, too. It's not just you. Why are they so low-rez? It looks like they had an issue with the maps in the PDF this time, because I just bought the PDF and have the same problem. And some people in the Costumer Service forums also has it. So any funny items in the bazaar? Just wait for the "Strange Gear" article in #16!